Dedicated to guiding clients through some of the most trying experiences of their lives, Jaclyn M. Nichols Attorney at Law serves clients in Somerset, Pennsylvania, and throughout Allegheny, Armstrong, Bedford, Butler, Cambria, Fayette, Indiana, Somerset and Westmoreland counties. Offering personalized attention and advice, Ms. Nichols aids clients with a range of matters, including those involving divorce, child custody disputes, property division, child support and alimony, DUI, traffic violations and other criminal matters. Whether straightforward or complex, family law matters are often emotionally draining for everyone involved. Our law office recognizes the personal nature of these types of cases and approaches every issue with the compassion and tenacious attention we would expect for our own families. We work to provide timely responses to phone calls and emails and provide regular updates throughout the legal process so people are aware of the status of their cases. Sitting down with people during a free initial consultation, we take the time to understand our clients' needs and goals, as well as their family dynamics. Perhaps people want to share custody but the other parent wants complete control? Some may be worried about how they will divide the family business or that their exes are hiding marital assets. Ms. Nichols crafts her approach based on each clients' unique circumstances and needs, and she strives to achieve favorable resolutions to their legal issues. 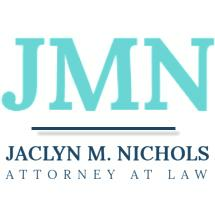 Beyond assisting her clients with family law-related problems, Jaclyn M. Nichols Attorney at Law also provides criminal defense representation. Understanding what may be at stake, from probation or fines to extended jail time, Ms. Nichols looks at each case from every angle and works to prove people's innocence or to see the charges against them reduced or dismissed altogether. To best serve those she represents, the law office accepts credit card payments.